Collett Park is the first park in the Mendip area to be awarded a prestigious Green Flag award. The Park was gifted to the town of Shepton Mallet, by John Kyte Collett in 1906. It is believed that as a boy, John Collett, was told off for playing in the fields that were privately owned at the time. After many years the land started to be auctioned off and John Collett accumulated several lots of land and presented them as a gift to the town as the park that we know and love. Every year we hold Collett Festival in the Park to celebrate the giving of this wonderful gift. The Collett Park Charity is held and managed by the Town Council. Click here to find out which councillors serve on the Park Management Committee. 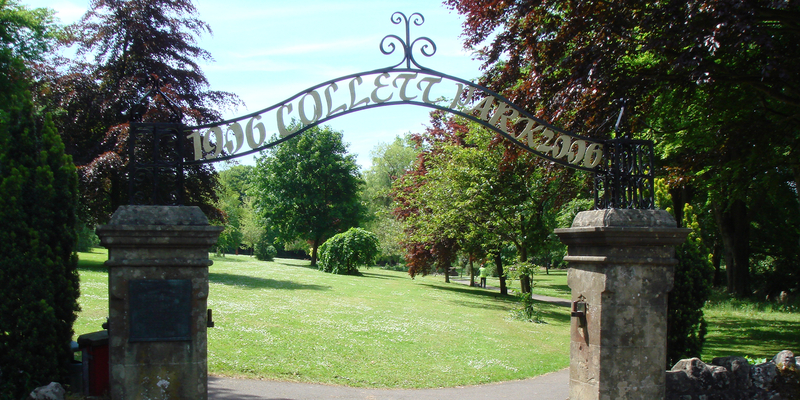 If you’d like to find out more about the history of Collett Park, find details of events and other things to do in the town, or even find accommodation for your stay, then please visit the Shepton Mallet Tourist Information Centre. Park facilities: Cafe with outdoor seating & programme of events, toilets (incl. disabled), defibrillator on toilet block, 2 play areas, outdoor gym, bandstand, large naturally fed pond, ball game area. Do you love Collett Park? Are you green fingered and keen to help improve the Park’s planting scheme, as well as have a say in its future development? Collett Park is held by a charity and managed by the Collett Park Management Committee. The physical landscape of Collett Park is maintained by the Town Rangers, Pete and Danny. The Committee and the Rangers would like to work with an active and dedicated Friends group to help improve the open space for the benefit of all visitors. If you are interested in getting together with other fans of Collett Park to help shape its future, then please contact the Town Council office.